As many of you know, about five months ago we ran a fund-raising campaign with Indiegogo. We raised over $15,000, which we’re now using in our outreach efforts to visit cancer centers around the country. At each stop, we’re introducing the products to consumers who need them most-patients, caregivers, physicians and nurses, anyone with dry, compromised skin. In previous posts, I told you about our first stop at the Dana Farber Cancer Institute in Boston, Massachusetts, and our second stop at St. Francis Hospital and Medical Center in Hartford, Connecticut. This time, I’m reporting on stop number three, at the Connecticut Children’s Medical Center. Connecticut Children’s Medical Center was founded as a 10-bed hospital for children who suffered incurable conditions like cerebral palsy, spinal bifida, and polio. It’s now one of only two freestanding children’s hospitals in New England, and serves as the primary teaching hospital for the University of Connecticut School of Medicine department of pediatrics. Consistently named among the best in the nation in the annual U.S. News & World Report “Best Children’s Hospitals” rankings, it offers comprehensive care to children and adolescents in a patient- and family-centered environment. Britta with the doctors and nurses at the hospital. As we did for St. Francis hospital, we sent products and copies of my book to the hospital ahead of time. I wasn’t prepared for the overwhelming positive response we received. Turns out that one of the patients was a seven-year-old girl who was struggling with cracked, red, and painful skin on her hand (not related to treatment). Her mother had already tried everything-drugstore brands, high-end creams and medicated creams. She had gone to the dermatologist and even tried prescription solutions. Nothing worked, so here was her poor daughter not only going through medical treatments, but suffering this mean rash on her little hand. The nurse received our samples and gave some to the mom. She told me that a couple days later, the mom came back to her and demanded to know what it was the nurse had given her. She said it was the only thing that had helped her daughter. Amazing! This is why I do what I do for a living! Britta speaking about toxins in personal care products. As we made our way to the many departments through the center, we sat down with the nurses, ra and radiologists and educated them on potentially toxic ingredients in standard skin care products. It was such a pleasure to once again explain the toxins that are present in most everyday products, and to see how open and eager they were to learn. 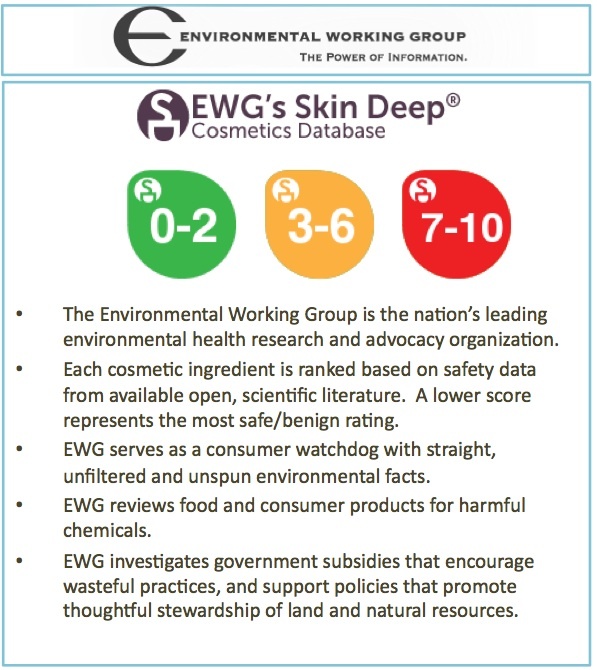 We told them about the Environmental Working Group’s (EWG’s) Skin Deep Cosmetics Database and how they rate ingredients according to the studies behind them, and products according to the potential toxicity of their ingredients. 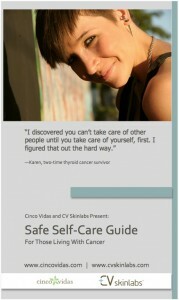 We also handed out our new “Safe Self-Care Guide,” seen here. It’s full of tips for managing the side effects of cancer treatments on the hair, skin, and nails. Meanwhile, our products were such a hit that we were told the hospital wants more samples, and would love to start recommending CV Skinlabs as a safer alternative to other products. We are so excited that safety is starting to become a priority for them in personal care products! They agreed that chemicals have no business in our skincare. I was even asked to return for a couple evening presentations to families where they get over 40 participants. I will be giving them tips on how to manage the side effects of medical treatments with natural, rather than chemical, solutions and share my journey from a child cancer survivors point of view. I can’t wait! Our next stop is the at Vantage Oncology in Atlanta November 21st . Stay tuned for the rest of our tour dates! 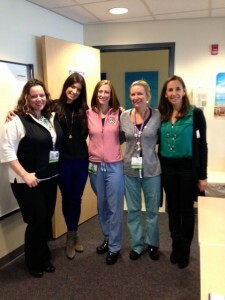 Have you ever visited the Connecticut Children’s Medical Center? Please share your experiences. Picture courtesy Children’s Connecticut Medical Center.